Dislikes: I may be a bit timid at first. Fenced yard required: Yes, I have a good amount of energy! Hi, my name is Dallas! I am a six year old male pug who is learning to love the pug life. I love my foster family and foster fur brothers. I really don’t like to be left alone, whether it is in a kennel or a room, and I will let you know it with my pug howls. My foster Mom says I am a stubborn boy, but so adorable that she gives me the time I need to adapt and learn new things. I am very healthy and active but have yet to master walking on a leash or running up and down many steps as I prefer my foster mom to just carry me, it allows for some extra snuggle time. Same goes for pottying outside. I prefer to be with my foster family so do better outside if they walk around with me then if I am left alone. I will get there, I just need time. My favorite things to do are to snuggle (my foster mom says I am the softest pug she has seen) as well as chew, on anything, so if someone gives me a good bone to chew on I enjoy that. 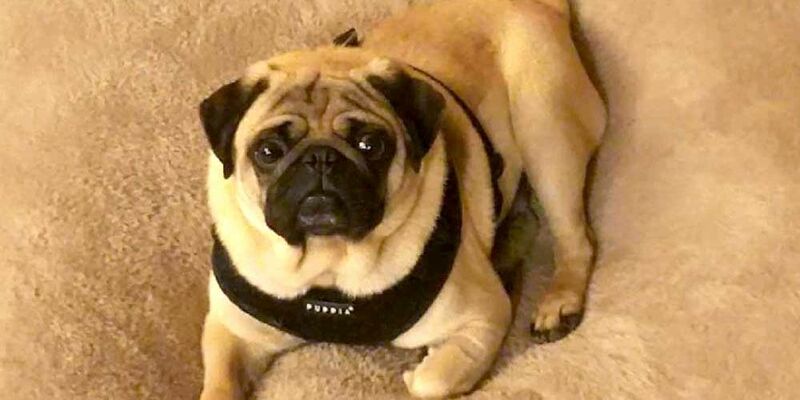 I am looking for a family who has the time and patience to help me continue to live the good pug life. In exchange, I will give unlimited love and affection. Interested in adopting? The minimum to adopt Dallas is $325.